There’s something about watching people get pranked that will never go out of style. It’s why Candid Camera graced our television screens for over three decades and why four childhood buddies from Staten Island were able to build a comedy empire with their hidden camera show, Impractical Jokers. What we love most about the TruTV series is that longtime pals Joe Gatto, James Murray, Brian Quinn, and Sal Vulcano are just as much victims in the pranks they pull as the unwitting strangers that get roped in. Here’s what you need to know about Impractical Jokers and its team of misfits before Season 8 premieres on March 28. According to the comedians, every prank you see is 100 percent real. "It's definitely authentic because the show works thanks to that genuine hesitation and fear, dealing with a stranger who doesn't know they're on a hidden camera show," Joe told Life & Style in a 2018 interview. "That's the magic of the show." In a reddit AMA, Sal acknowledged that their jobs have gotten a little bit harder the longer they’ve been on TV, "but the truth is for every person that recognizes us, there are a hundred who don't," he explained. "If we ever get to the point where it's too much, I guess that's a good problem to have?" Though the pranks aren’t staged, producers will intervene if an eager fan is threatening to ruin a scenario. "We have our production team that helps us swoop in and Liam Neeson these people, like [in] Taken — [they] pull them off to the side," Joe revealed. Where does Impractical Jokers film? The New York natives film in and around NYC, of course! At the start of each episode, the four pranksters challenge each other to perform outrageous dares, like posing as a terrible opening act for Imagine Dragons or seeking donations for a fake cause. During his AMA, Sal confirmed that everyone shown on camera must give written permission for their footage to be used. One time, they had to scrap clips of a couple in IKEA because the man refused to sign on the dotted line. "When it came time to release them so they could be on camera he said he had a great time but he couldn’t sign because he was married," Joe recalled in an interview with Comedy Central. "He wasn't with his wife — he was with his mistress and he was buying her discount Swedish furniture." What does Impractical Jokers pay their "victims"? Most of the individuals who appear on the series get absolutely nothing. "Usually people are pretty cool when they find out it's a show," Sal shared. "The few who get mad we try to convince otherwise, or they get blurred, or cut from the show. On rare occasion if the person was gold, we try and throw them a few bucks to coerce them." An editor from the show added on reddit, "99.99 percent of people are extremely relaxed and casual when approached about being on the show. Those that get blurred don't necessarily do it because they're angry, but more often because they just don't like the idea of being on TV in general — or in some cases because they were skipping work or other personal reasons. I can think of only a handful that were genuinely upset." 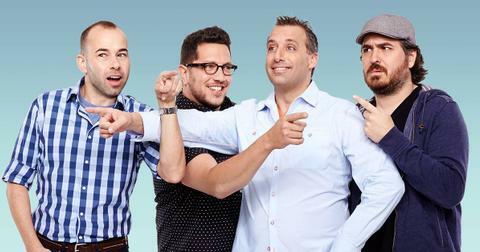 Watch new episodes of Impractical Jokers starting March 28 at 10 p.m. ET on TruTV.